Bandipora, Dec 06 : Even after the lapse of more than 20 years, the District Administration Bandipora is still struggling to find a permanent dumping site in the town. 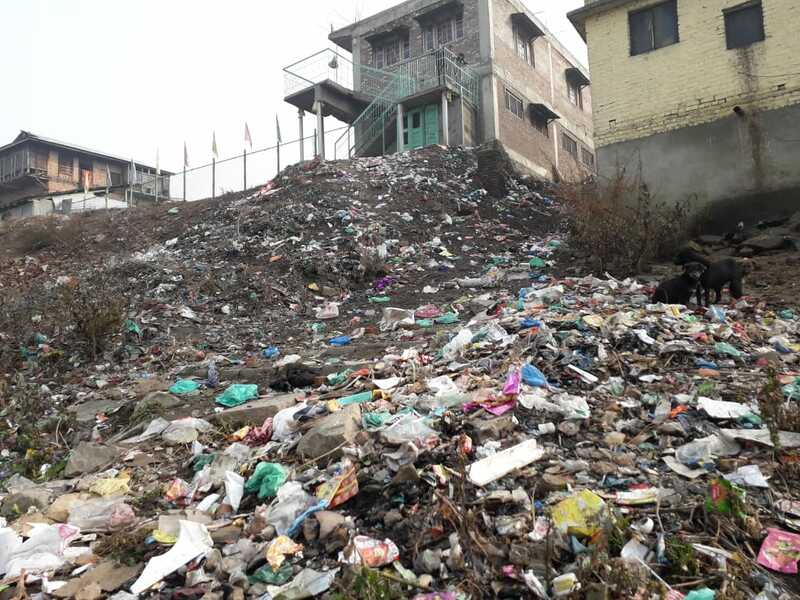 Local residents talking with Kashmir Despatch said that there is no permanent dumping site to dispose this huge amount of garbage in Bandipora town, which not only have increased the population of stray dogs but also posing a threat especially to students and elderly persons. Locals said that everyday production of garbage is increasing but due to lack a proper dumping site, Municipal Council in town garbage heaps remained in the Gulshan Chowk which looks now garbage duping site. They said that the solid waste is being thrown on the roads and also into the drains leading to their blockade. Group of shopkeepers alleged, they are not able to run their businesses properly because customers sometimes avoid visiting their shops. They said that our business has been hit badly due to the prevailing unhygienic conditions in the town. Executive officer Municipal Council Bandipora Wali Mohammad when contacted this newspaper said that we are looking for a suitable land for garbage dumping for the town. Pertinently,Dumping site has been a major problem in Sopore town from last many years. Locals of the town claimed that Muncipal Council Sopore is struggling to finalize permanent landfill site on permanent basis to resolve this long problem in town as their all efforts seem useless. In Sopore town Muncipal Council dumps garbage along Jhelum banks which not only pollutes the water body but also poses threat to the lives of dozens of people who consume the water. Authorities at Municipal Council Sopore when contacted told Kashmir Despatch that the Jhelum banks would be used for some time, added that we are trying hard to manage this huge garbage in the town.